A voice counts down in my ear as I am rocketed out of a tube into the site of a massive space battle. I spot an enemy on the horizon and immediately start racing toward him, not noticing another ship swinging out from the debris to my right. Suddenly I hear the alarms in my cockpit signaling that missiles are locked on and incoming. I try to react, pressing the button to launch my defense flares, but it is too late. Seconds later I am staring out through my broken cockpit window into the vastness of space, contemplating my first death of the match as my body crystallizes in the cold. EVE: Valkyrie has been in development from Iceland-based CCP Games since the earliest Rift development kits, though it has changed names and been reworked considerably over the last two years. I had a chance to go hands-on with the game at this year’s CCP Fan Fest and walked away impressed, but the title still had a ways to go at that point before it was ready to be a full-blown game. Since then, CCP took on $30 million in additional funding and quickly put that money to good use, creating what may go down in history as the first-ever truly AAA-level game in VR, one that really shows off the years of development going into it. 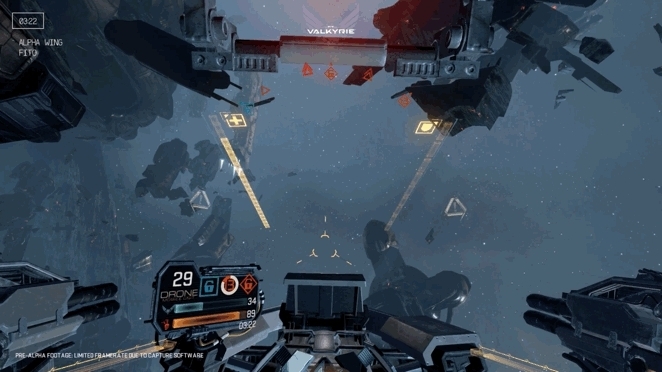 Multiplayer combat is at the heart of EVE: Valkyrie’s gameplay. In the pre-Alpha demo I had a chance to play, I was shown two different multiplayer game modes. The first was a standard death match. A mainstay of online FPS gameplay, the mode translates well to VR instantly thrusting you into a competitive atmosphere. According to CCP, the studio was testing 8 versus 8 matches with voice chat enabled. I didn’t see matches that size, though. The second game mode I had a chance to play was tentatively called “Control”, a variation of capture the flag, Control has you drop drones on capture points around the map. These drones drain resources from the other team’s pool while you go off and attack or defend the positions. From here it becomes a game of drone defense as teams try to knock out the other team’s drones on their capture points to gain control. The first team to drain the other team’s resources wins. While the game does not offer a single player campaign, it does offer a series of different single player game modes for you to play and familiarize yourself with the game. 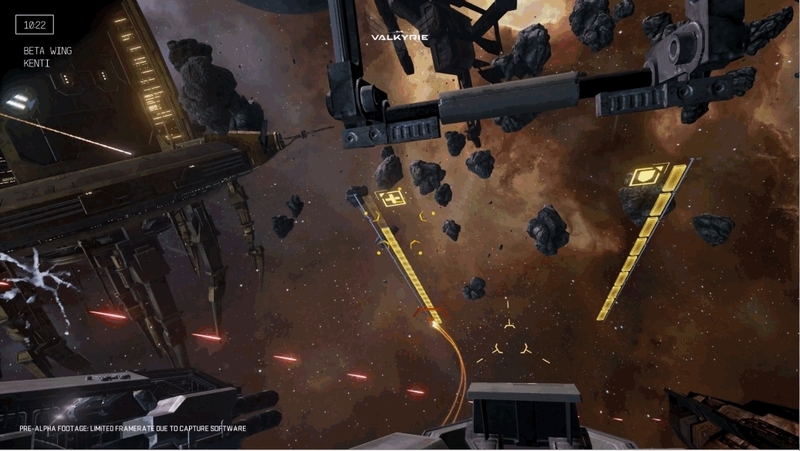 There is a standard survival mode where you fight off endless waves of increasingly difficult enemies as well as a “Scout” mode that allows you to simply fly around the battlefield and discover lore about the universe, which is something extremely important when you consider CCP’s core audience of EVE Online players are among the most detail and game universe obsessed in the industry. In addition, there is also a mission-driven “Recall” mode that has you complete a number of short missions with a series of objectives meant to teach the player the game’s core mechanics. No matter which mode you play, you are likely going to die – a lot. And when you do you are sent back to the clone vats where you are able to select your next ship from four presets before the match. The ships fall into three basic classes, with a detailed progression tree that interweaves between them. The first and most balanced is the “Fighter” class. These ships have a healthy balance of shields, speed and power and is ideal for ‘dogfighting’ in space. The base ship, called the “Wraith,” is equipped with a pair of Gatling guns as well as a look-to-lock missile system. The missile system is a crucial piece to making Valkyrie not just a game in VR, but a game for VR. Not only does it add something that simply wouldn’t be work in a 2D game, it does it in a way that forces a player to look around – something that isn’t a natural behavior for many people the first time they get into VR. The look-to-lock missiles are one of the features that truly makes this a made for VR game. For those looking to play the role of Tank on the battlefield the “Heavy” class might be a better fit. With a stronger emphasis on power and defense, the main Heavy class ship is very slow, but it compensates with a chargeable “Warp Drive” which can zip you around the battlefield, but the change does not last very long; it is also equipped with a massive look-to-aim flack cannon that does splash damage. It’s pretty fun to warp in and murk a whole crowd. Finally, there is the “Support” class, which is fast but offensively weak. These ships act more like medics. The base Support ship is equipped with a simple set of lasers but the real power in this class comes with its secondary arsenal. The base ship includes look-to-lock buff/debuff beams with can charge the shields of your teammates, or damage those of your enemies. Additionally, the ship is equipped with “spider bots” which spin a nano-web behind you. If a teammate flies through the web they receive a temporary shields and health boost, but if an enemy flies through they get blasted by an EMP and are forced to contend with little spider bots crawling around the cockpit and obscuring their view for a short while. If you watch carefully you can see the support buff beam in action. Beyond the three standard classes the detailed progression tree allows you to earn XP to each of the three branches of the tree depending on the ships you used and points earned using those ship classes. For example, if you use a ship that has strong Fighter qualities, but also has some Support aspects as well, you will earn more points to the Fighter class than you will the Support class. You will also receive a total XP which is used to determine your rank amongst other players in EVE: Valkyrie. The XP you earn from your battles will eventually total up toward various milestones, which can unlock ships with new abilities that blend the three main classes together. However, just because you unlock a ship doesn’t mean you will automatically get it. You have to build it first. When you reach a milestone you will be awarded a blueprint for a ship and that blueprint allows you to build the ship, but it will cost you some of the in-game currency known as salvage. There are three types of salvage: raw, component, and prime, which get their name depending on its rarity. Every time you or a teammate kills an enemy in combat they will drop these little glowing green capsules. If you pick them up you will receive a little boost to your shields, but it will also add salvage to your team’s pool. At the end of each match that salvage is then evenly distributed among teammates, preventing one person from being… well, a loot whore. 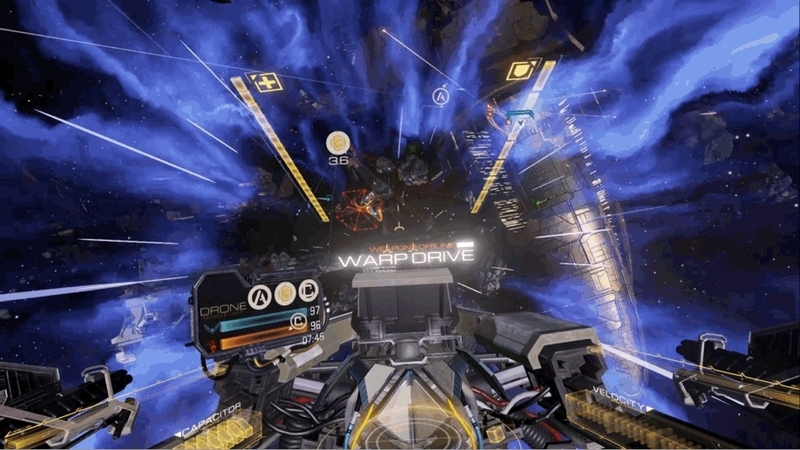 To take advantage of all these customization levels, EVE: Valkyrie needed an excellent user interface and the team managed to accomplish that quite well. At no point do any of the menus really pull you out of the experience. Rather than going with traditional interfaces the UI is integrated within the ships and menu screens themselves. For example, when you load up the game you are presented with a hanger that shows holographic projections of various different game modes, settings, and customization areas. In-game UI is all displayed within your cockpit, adding to the sense of immersion. On the Oculus Rift CV1 “engineering sample” I tested the game on, all of the interfaces were clearly legible without needing to lean in from a comfortable gaming position. EVE: Valkyrie was created to be the kind of game you can simply pick up and instantly know how to play well enough to get a kill or two in your first match, but offers additional layers of complexity to keep players satisfied for hours on end. 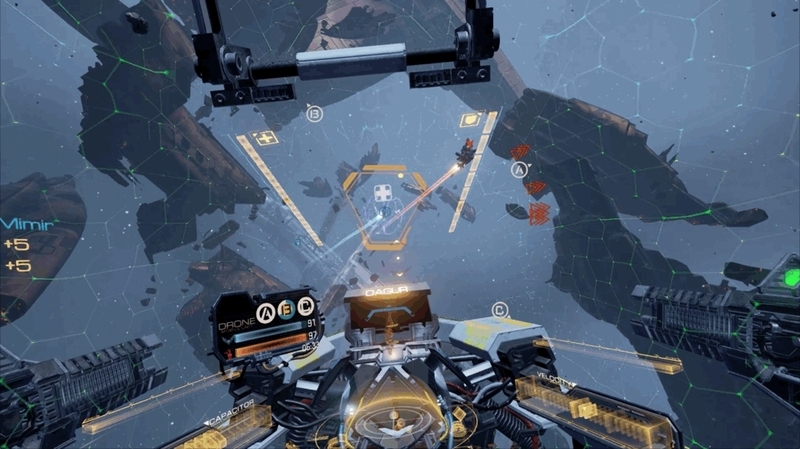 As a multi-platform launch title for VR, Valkyrie delivers the kind of polished, simple but sophisticated gameplay that you would expect from a major release title. This truly is the title VR needs to appeal to the masses. But you don’t have to take my word for it, Oculus’ founder Palmer Luckey said he believes EVE: Valkyrie will be one of the “major faces of this generation of VR technology,” which is probably why it will come bundled with pre-orders of the Oculus Rift, whenever those may be. 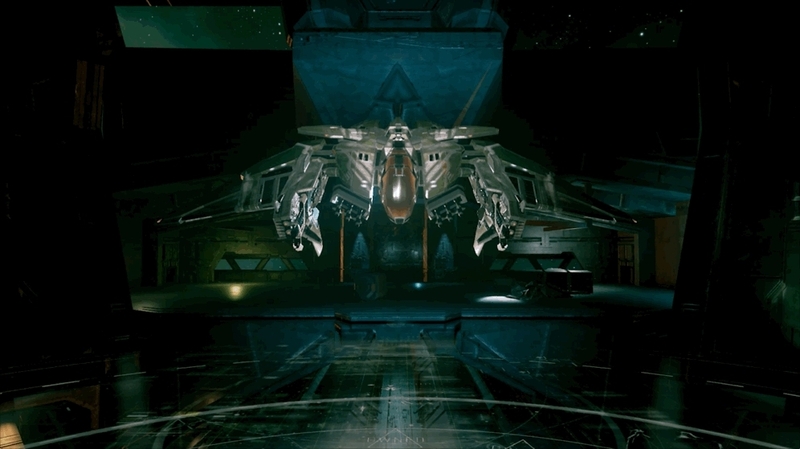 EVE: Valkyrie is slated for release in Q1 2016 on the Oculus Rift. CCP says the game will also come to Sony’s PlayStation VR. There is no word yet on whether the game will also support HTC Vive.